I was born in Bryan while my Dad was attending veterinary school at Texas A&M. I was raised in the Galena Park/North Shore area of East Houston. That is the "north shore" of the ship channel. I attended the University of Texas where I met my future wife Jo. To the surprise of many, primarily my parents, I graduated from the University and was fortunate enough to be granted admission by the kind folks at the University of Houston to their very fine law school. At this time, I decided it was time to try studying for a change. That endeavor was made easier by the fact that I always wanted to be a lawyer and enjoyed law school. I, in fact, distinguished myself to some extent by becoming a member of the Houston Law Review and by being admitted into the Order of Barons (the highest honorary legal scholastic society at the University of Houston Law School). Jo, being from the small town of Lockhart just south of Austin, would have nothing to do with living in Houston. So upon graduating from law school, we moved back to Austin and I became a briefing attorney for Judge H.P. Green on the Court of Criminal Appeals. Shortly thereafter, good fortune shined upon me again and I was hired as an Assistant U.S. Attorney for the Western District of Texas. In that job, I came under the tutelage of several fine trial lawyers and discovered I had some talent in that regard. I tried over 40 jury trials while at the U.S. Attorney's Office and appeared over a dozen times before the Fifth Circuit Court of Appeals. One of my most notable trials was the prosecution of Jimmy Chagra on drug charges after the assassination of Judge John H. Wood Jr. In 1984, I went into private practice with a group of lawyers, many of whom I continue to practice with to this day and consider my dear friends. Since that time, I have tried over 50 civil jury trials in state and federal court. I am Board Certified in Personal Injury Trial Law by the Texas Board of Legal Specialization and a member of the American Board of Trial Advocates (ABOTA), an invitation only organization comprised of distinguished trial lawyers on both the plaintiff and defense side of the docket. 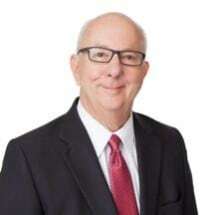 I have been included in Texas Super Lawyer® magazine (a Thomas Reuters publication) from its inception in 2003 through 2018.
obtaining a judgment in excess of $840,000 against a California corporation for contaminating a municipal utility district’s water wells after the failure of a sewage lift station.